I needed a photo for my latest local history newspaper column. Unfortunately, the place I needed to visit was, according to Google Maps, an hour and nine minutes away. But, what the heck, it was a good excuse to get out of the house and take a Sunday drive. It would have been even better if there were more road signs but more on that later…. I wrote a story on a little place called Radec. Back in the good old days, a person could petition the United States Postal Service to start a post office, usually in their home or store. If approved, the post office would be given a name. However, the name could not be the same as any other post office anywhere else in the country. This particular post office was located in an unnamed area in southwestern Riverside County (then northern San Diego County). The man who proposed the post office suggested the name “Cedar.” However, there was already a post office in Colorado by that name. So the man just flipped it and suggested “Radec” which is cedar spelled backwards. As was common, the area around the post office became known as Radec as well. Radec was always an area of far flung ranches, never a town. So, with time, the name fell out of use. Now there is really only one thing left that bears the name, and that is the Radec cemetery. So off we went on our Sunday drive to find that little cemetery so I could take some photos. The views of the hills along the highway are very scenic. The countryside along 79 is dotted with the occasional ranch, some of which are owned by people with lots of money. One large property had what looked like brand new white equestrian fencing all along the road and behind the fence were recently planted pepper trees, dozens of them. When the pepper trees mature they will block the ranch from the prying eyes of passing cars. As you get futher south the rolling hills become very rocky, which makes for pretty views as well. If you keep taking 79 you will eventually be able to go to Julian, a picturesque town in the mountains of San Diego County. I told Hubby we should do that one of these days. But yesterday we were on a mission. Unfortunately, our mission kept being thwarted by a lack of road signs. The road we were looking for, Sage Road, was, I thought, a fairly major intersection with 79, given that were were out in the middle of nowhere and all that. Well, it was apparently not major enough, and we blew right passed it, never seeing the one tiny road sign. The intersection was weird, in that it was not just a “T” but had additional diagonal paved areas leading to and from the highway. I am sure they are there to give the folks coming off of Sage Road a fighting chance to get on the highway when traffic is heavier, as the cars on the highway are going very fast! But because of the extras “wings” shall we say, it was easy to miss the one and only street name sign there, and we sure missed it. We knew we had a problem when we got several more miles down the road and saw the “San Diego County Line” sign. Oops! When one sign says “HWY 79″ and the other says “Sage Rd” you don’t get many horizontal inches of green road sign to look for. We totally missed this one as we went south and almost missed it when we turned around and came back by. We turned around and I pulled out out my phone and manged to pull up Google maps once again. This worked well and we were able to find Sage Road, finally. However, once we turned, we couldn’t find the cemetery. The smart phone was only so helpful, as the cemetery was not showing up, and then we lost the signal. Did I mention we were out in the middle of nowhere? We turned around and regained the signal, and I called Eldest Daughter back at home to try and get some help, when, low and behold, I spotted an American flag. Photos online had shown that there was a flag pole at the cemetery so I was able to tell Eldest we were good and Hubby turned the car onto a short dirt road which took us to the cemetery. It sat a bit off the road, not right on it. 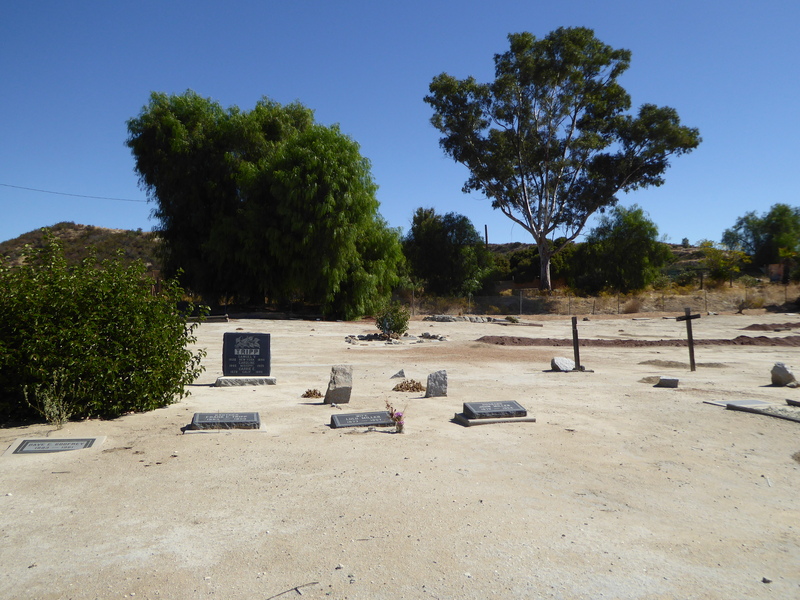 I have no idea when the first burial occurred, but there were headstones which indicated some folks were buried in this little country cemetery in the 1890s. With our mission accomplished, we turned the car north and headed home on the lonesome highway once again. 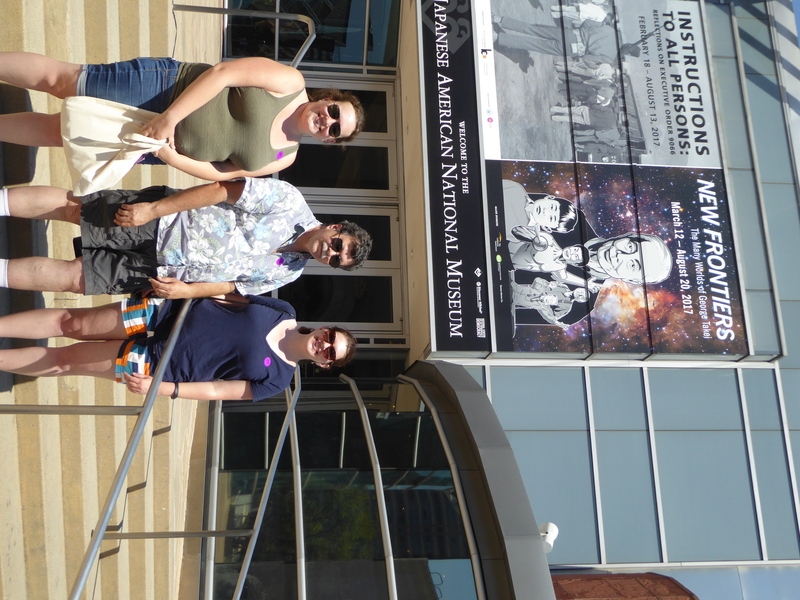 I was going back through my draft posts and found I had started a post about a visit we made back in June to the Japanese American National Museum in Los Angeles, but had never finished and posted. So, here it is! I am not going to get in to the drive, because I already discussed that in a previous post. 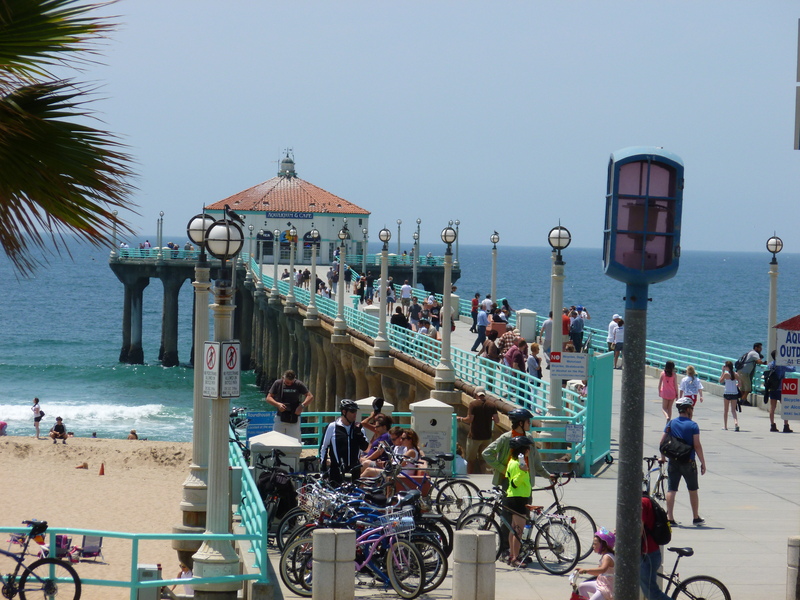 But, being Sunday, traffic really wasn’t bad, and we were able to zip in and out of Los Angeles with a minimum of time, which was nice. 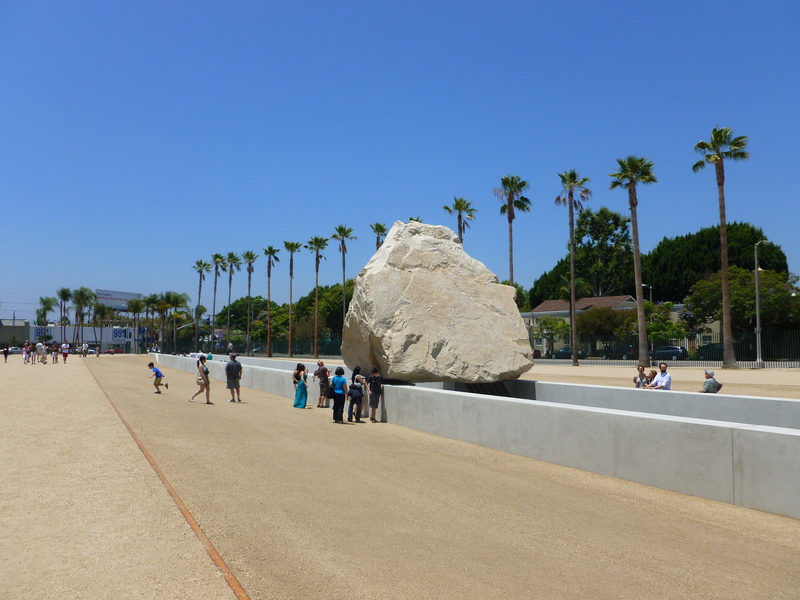 The museum itself does not have a parking lot or garage. However, their website directed me to another site which had a map of all the local parking garages, rates, addresses, etc…. I picked the closest one, which turned out to be just across the street from the museum. Nice! Unfortunately, the museum was having air conditioning problems the day were were there, which did not encourage us to linger at any displays other than the George Takei exhibit. 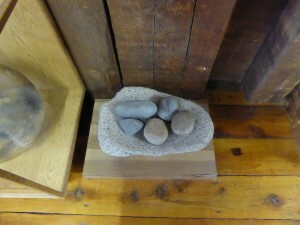 We did look at some displays, we just didn’t spend as much time as we otherwise would have. There was an actual building from a relocation camp. 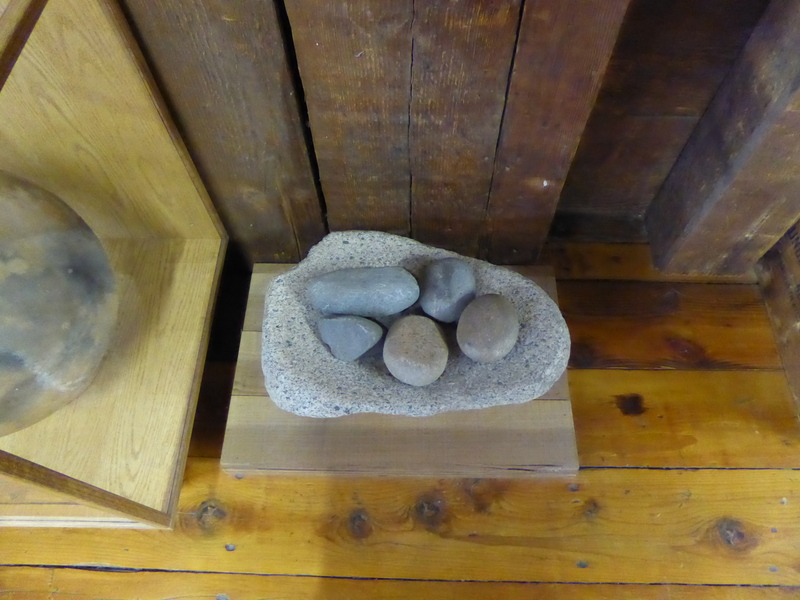 There was also the Common Ground exhibit, which chronicled over 130 years of the Japanese American experience though hundreds of objects.The museum had a good sized gift shop with an extensive book selection. Just across the mall from the museum is a vintage building, built in 1902, which holds the “Go For Broke” National Education Center. You can buy a duel ticket, which saves you a little money and lets you in to both museums. “Go For Broke” was the nickname of the 442nd infantry regiment who fought during World War II. It was comprised almost entirely of men of Japanese ancestry. It was the most decorated unit for its size and length of service in the history of American warfare. We did not visit it that day, as we had other plans for Father’s Day, but it would definitely be a good addition to a day out in that area. We parked in the parking garage for the Japanese Village Plaza. After our warm walk though the museum, we decided to stroll around this open air shopping area, enjoy the breeze on our sweaty faces, and gt a cool drink. 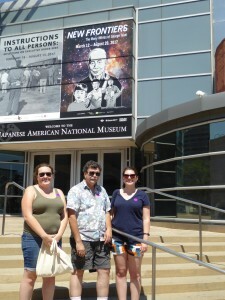 Since it is just across the street from the museum, it was a convenient addition to our plans for the day. 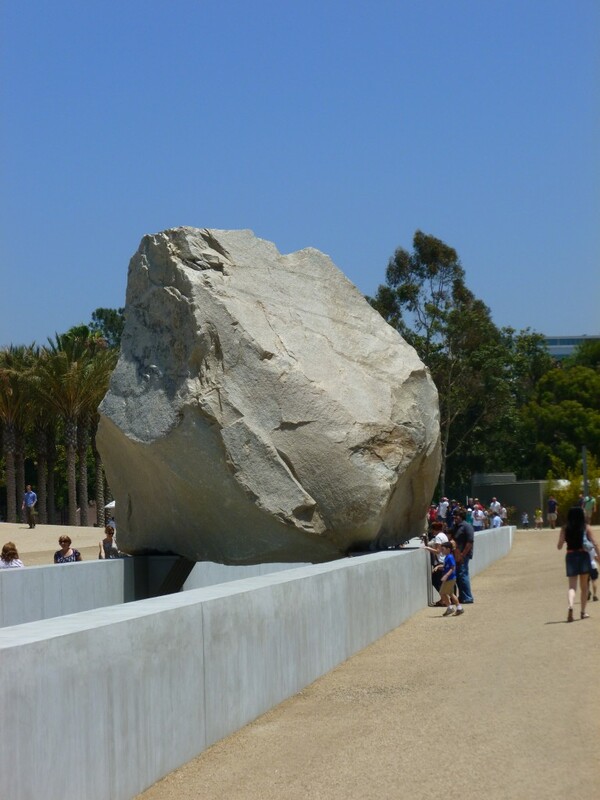 The Japanese American National Museum is located in the Little Tokyo area of Los Angeles, so you can definitely make a day of it when visiting that area. 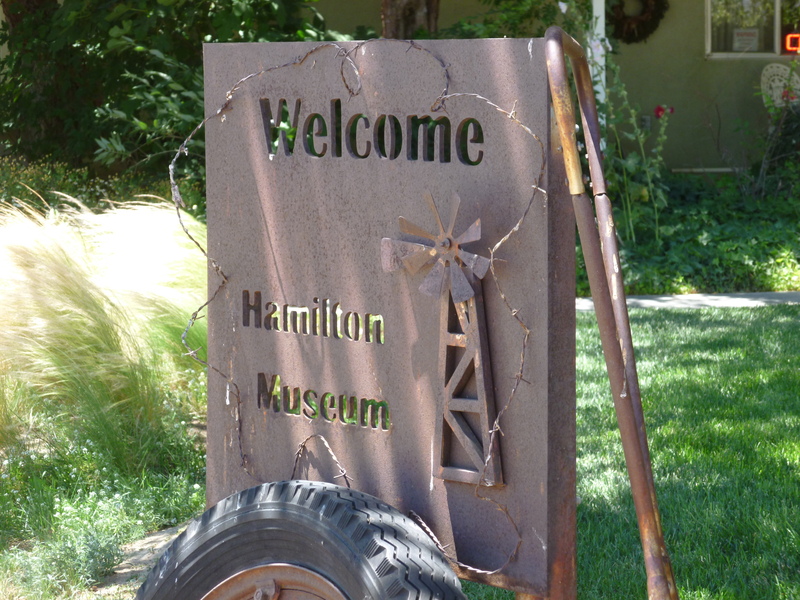 If you feel like a drive, at least part of which takes you away from freeways and out across the countryside, make a visit to Hemet and the Hemet Museum, run by the Hemet Historical Society. The museum is located in the freight area of the city’s historic Santa Fe Depot. 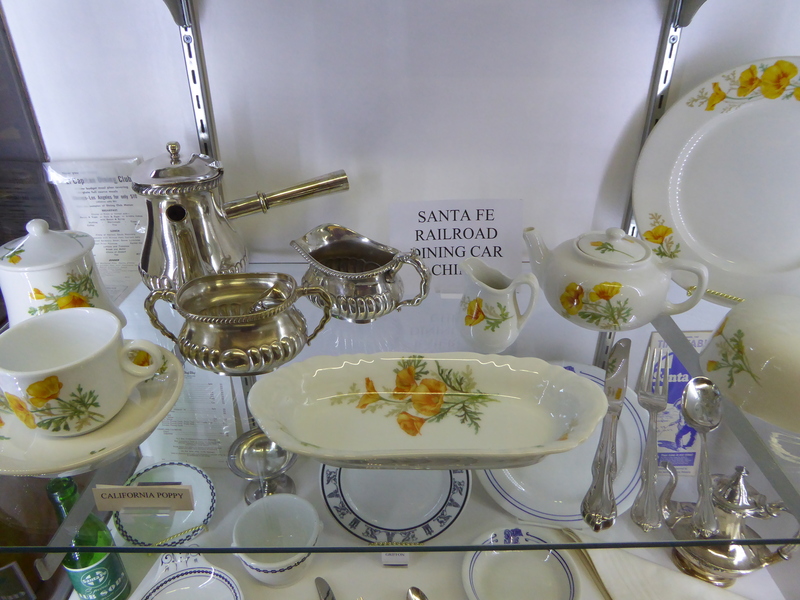 The museum is small, but it is chock full (in a good way) of all kinds of things related to the history of Hemet, with a special emphasis on the railroad. I particularly enjoyed seeing the case full of dinnerware used on the Santa Fe trains back in the day. The service with California poppies was especially pretty. 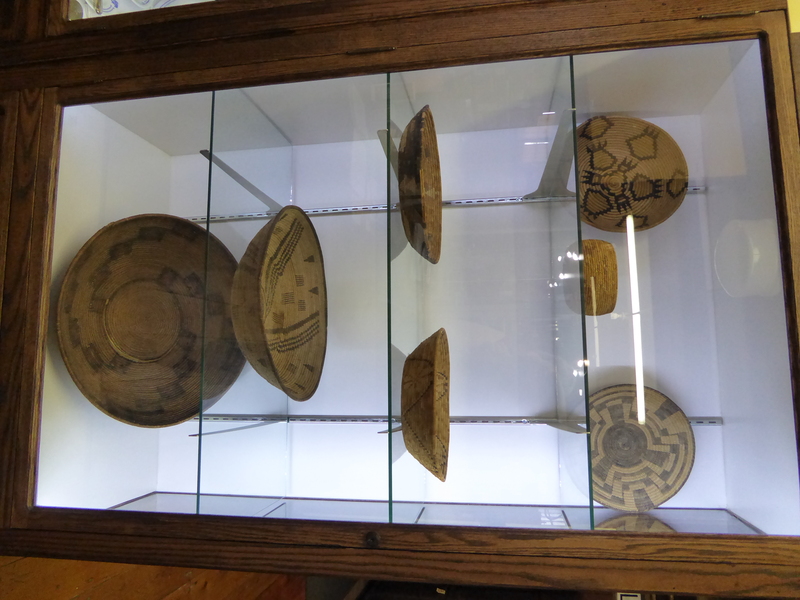 There were displays related to the area’s first inhabitants, including grinding stones and baskets. Feeling like someone may be calling you aboard the train? Imagine getting on the train in this beautiful dress…. An old barber’s chair, among other things. 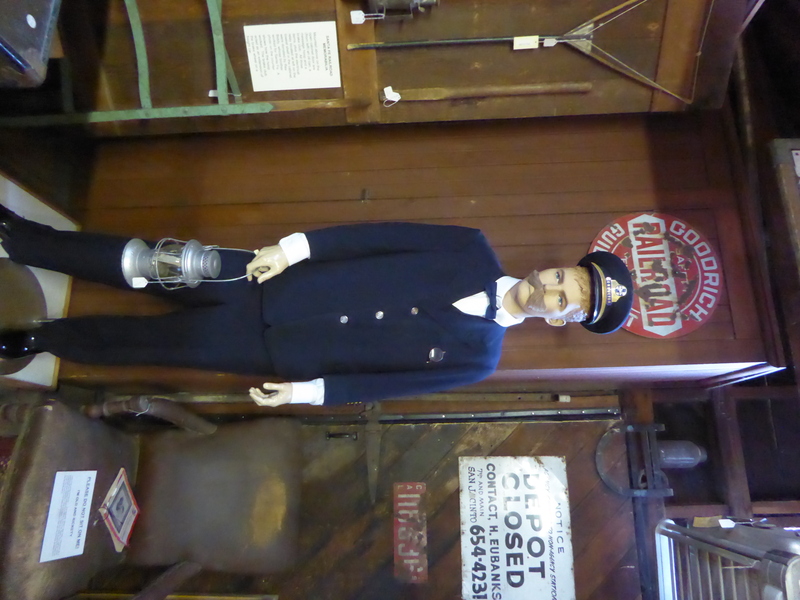 In the other part of the historic train depot (the passenger side, I presume) is a coffee and sandwich shop. My friend and I stopped in for lunch. I was pleased to see that the limited sandwich selection was nonetheless interesting and included combinations I had never see before. For $ 5.95 I had the “London” which consisted of ham, Muenster cheese, onion jam, lettuce and tomato on wheat bread. The onion jam, which was sweet with a hint of vinegar, really put the sandwich over the top for me and I really enjoyed it. and For an additional $2.00 you can add a drink and bag of chips to your meal. 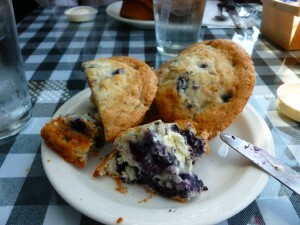 They also have paninis and bagelwiches on the menu, vegetarian selections, and a child’s menu for those 12 and under. Next time I think I might try one of their nine types of wafflewiches. These are served on waffles and included everything from breakfast types, lunch types and even some that would be delicious for dessert. Espresso waffle anyone? I know a couple of daughters who would try that with me! Current hours of operation at 11-3, Tuesday through Sunday. CLOSED THE MONTH OF AUGUST! A couple of weeks ago (my, how time flies!) 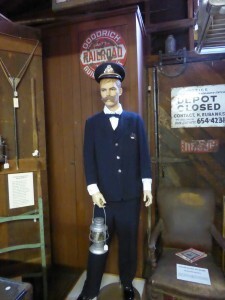 Hubby took a day off work and we went off to see Heritage Hill Historical Park. 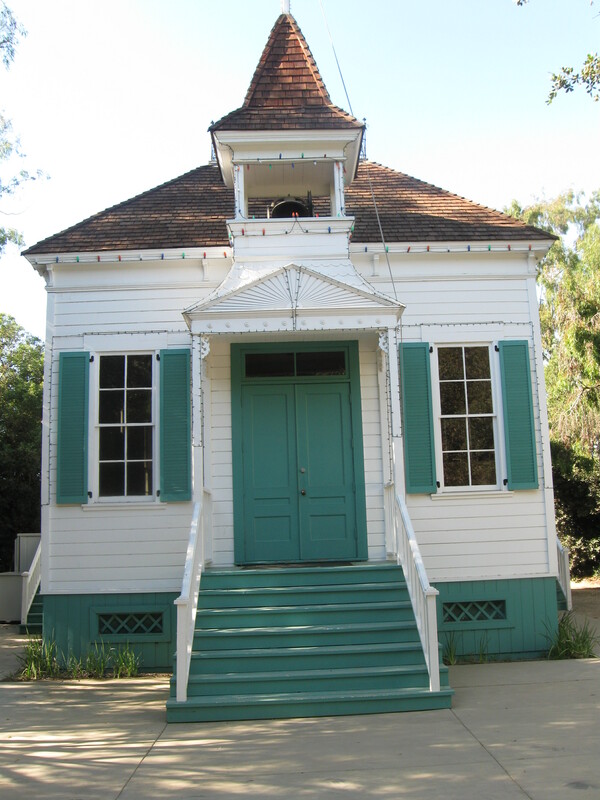 Heritage Hill is operated by the county of Orange and is located in Lake Forest, California. It has four restored and furnished historical buildings. We had a lovely time taking the docent led tour though all four! The Serrano Adobe it original to the site and dates to about 1863. It was very cool seeing the original wood thresh holds at each door and how they were worn down through the years by many, many steps. 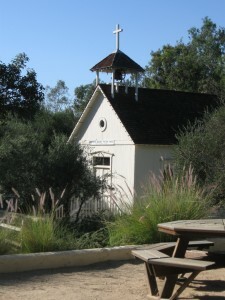 The other three buildings were the El Toro Grammar School (1890), St. George’s Episcopal Mission (1891), and the Harvey Bennett Ranch House, (1908). 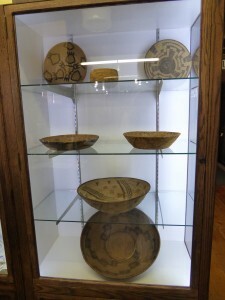 Each has its own story which is unique, but also ties together to the town of El Toro. 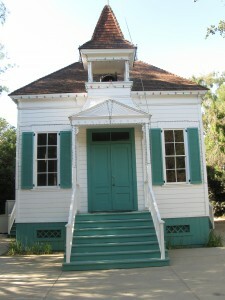 The historic town of El Toro was included into the city of Lake Forest when it incorporated in 1991. Heritage Hill has some tables sitting out under the trees, if you want to sit and have a snack (like we did.) 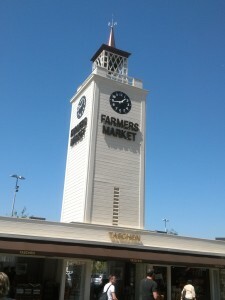 It actually shares a parking lot with a shopping center that includes a Ralphs grocery store. We walked down to the store, bought a snack and some drinks, and went back and enjoyed it at Heritage Hill. 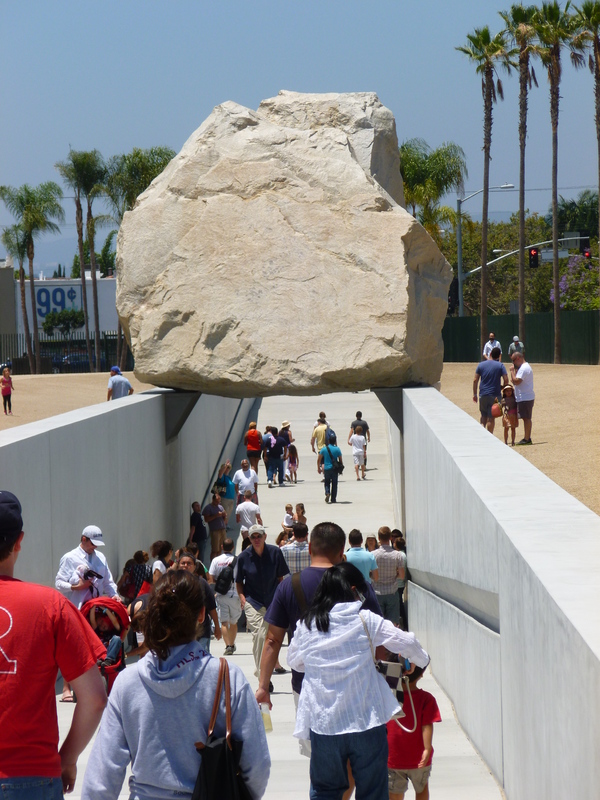 Guided tours are given Tuesday through Saturdays at 2 p.m. There is also an 11 am tour on Saturday. Entrance and the tours are free! 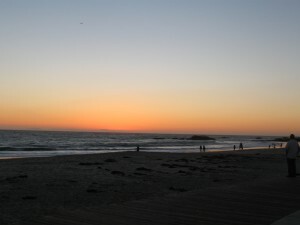 After visiting Heritage Hill, we went to Laguna Beach, just in time to see the sunset. Lovely! Youngest Daughter has been asking for a family trip to Oak Glen and with temperatures back up above 100 last Saturday, we decided seeking a cooler place at a higher elevation would be a good idea. We headed a little under an hour from our home to Oak Glen. 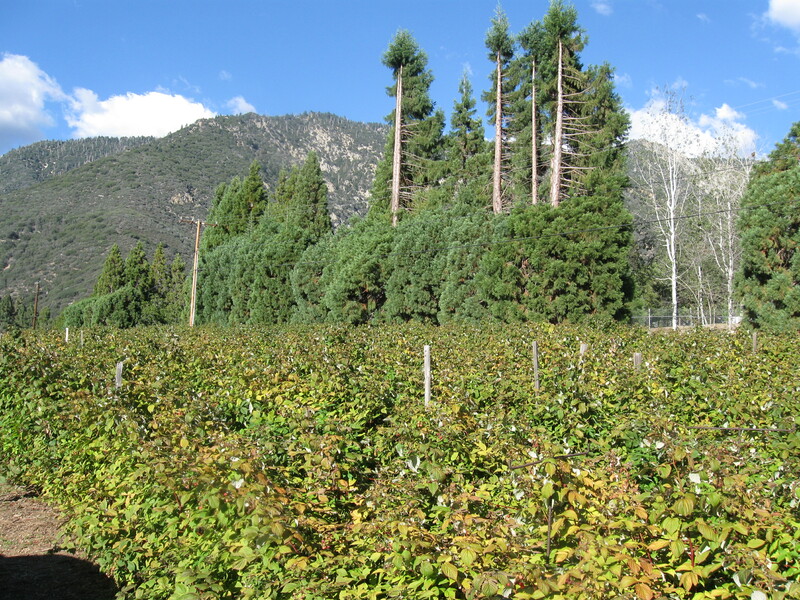 Oak Glen is located in the foothills of the San Bernardino Mountains. 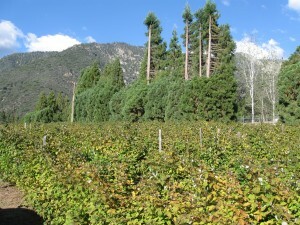 It sits at a high enough elevation that people have been growing apples there since the late 1800s. Apples are still grown there, as well as other stone fruit and raspberries. 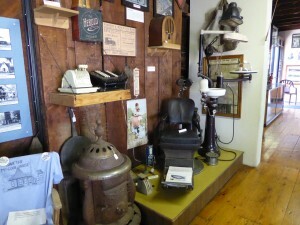 There are lots of things to see and do, in a pleasant rustic setting. And, if you like apples, you will be in heaven! There is lots of beautiful scenery in Oak Glen. This shows a raspberry patch with the mountains in the distance. On this trip, our first stop was at Mom’s Country Orchard. Their little shop included many home-made jams and jellies and they were happy to give you samples of any you wanted to try. I picked out a couple of jars to give to friends at Christmas and a loaf of Strawberry-Banana bread for us. We also got to try some apple samples. 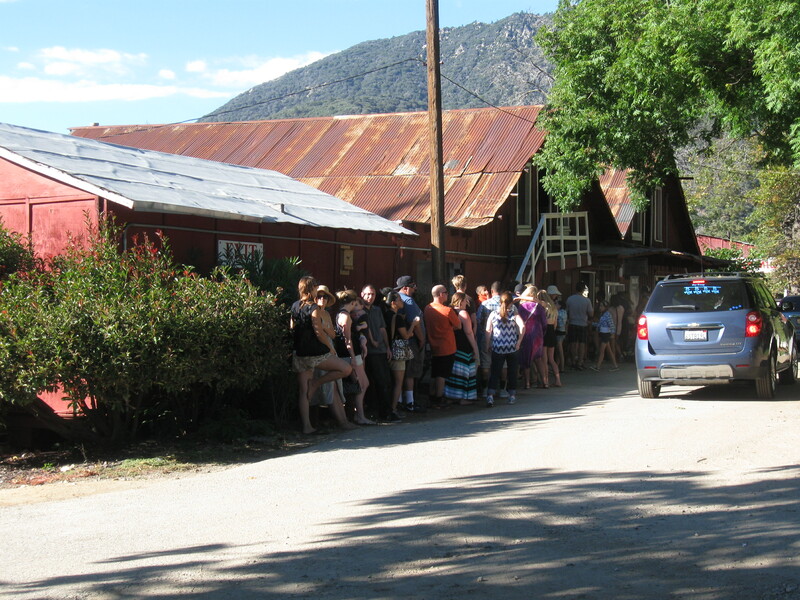 On we went to out next stop, Snowline Orchard. That was a larger and much busier place. A long line waiting patiently to get inside one door of the shop made us curious. I just had to ask what they were standing in line for. Hot cider donuts I was told. Apparently they have quite the following. We had our heart set on apple pie this trip so we passed on the donuts, but we vowed to get some next time. 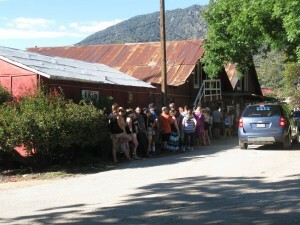 The line for apple cider donuts. Inside we took advantage of the wine and hard cider tasting and picked out a bottle of wine to take home. We also added a loaf of apple cinnamon bread to our purchases. An apple tasting area gave us the chance to taste quite a few different apple types and we picked out a small bag of Jongold apples to take home as well. Our final stop on this trip was Oak Tree Village. That was a big place with lots of booths selling all kinds of things. There we ate hot dogs for dinner. I bought some cider to go with my dinner and let everyone else have a sip. 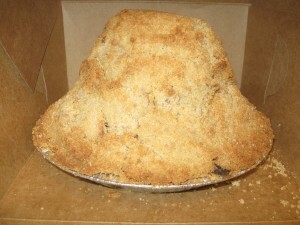 We also bought an apple pie to bring home for desert. The final apple tally was: multiple apple samples, cider, hard cider, and samples of apple jams and jellies plus apple favored wine, apple pie and apple bread to bring home. Youngest agreed that our trip to Oak Glen had met all of her expectations and we all agreed that we had an apple-tastic time. This is the apple pie with crumb topping we bought. The photo doesn’t do justice to how crazy big it was. 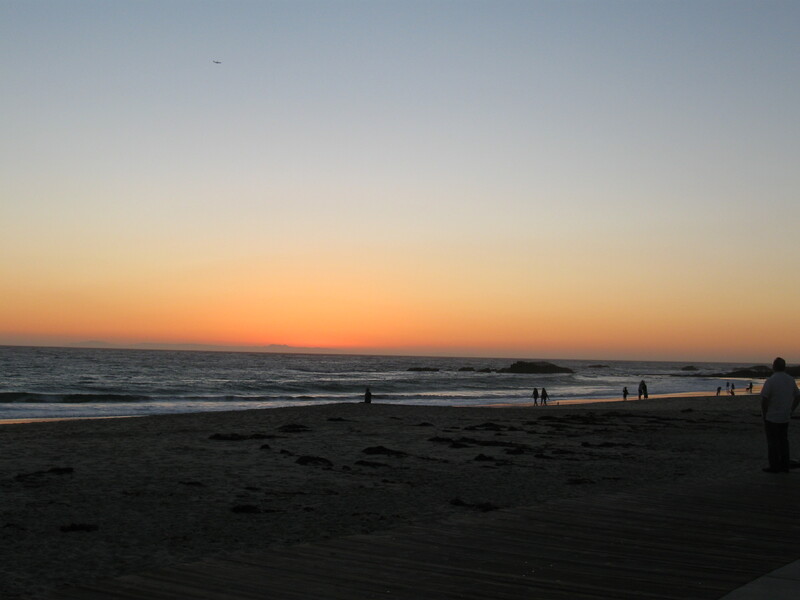 We are very lucky in that we live within an hour of the mountains and the beach. However, the beach means fighting traffic and the mountains means those of us with motion sickness problems don’t relish the twisting, winding roads to and from the mountains. Yesterday, for Labor Day, we found the perfect solution. We visited Wrightwood. I have been wanting to go to Wrightwood for years, literally years. I would always think of it in the winter, when I didn’t want to go, and would always forget about it the other nine months of the year when it would be lovely and snow free. Well, I finally thought of it at the right time of year and suggested it to the family as a Labor Day outing. Everyone agreed they wanted to avid the traffic going to he beach and we headed the opposite direction instead. 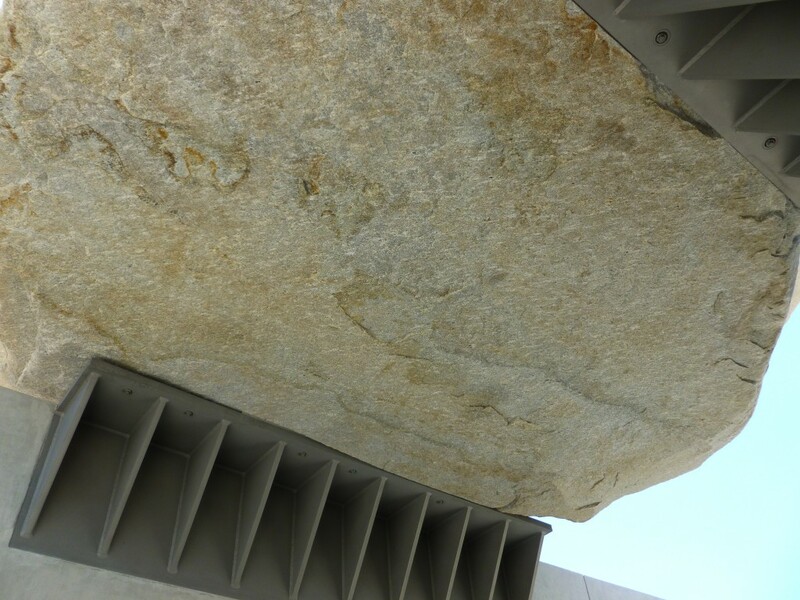 Once you are off the freeway and onto 138 you get to see up close some spectacular rock formations that you can only see from a distance when you are on the freeway. You also get to see some lovely high desert landscapes. It appears that the county is widening 138 from 2 lanes to four, so be forewarned of that. Once that is done it will be smooth sailing. 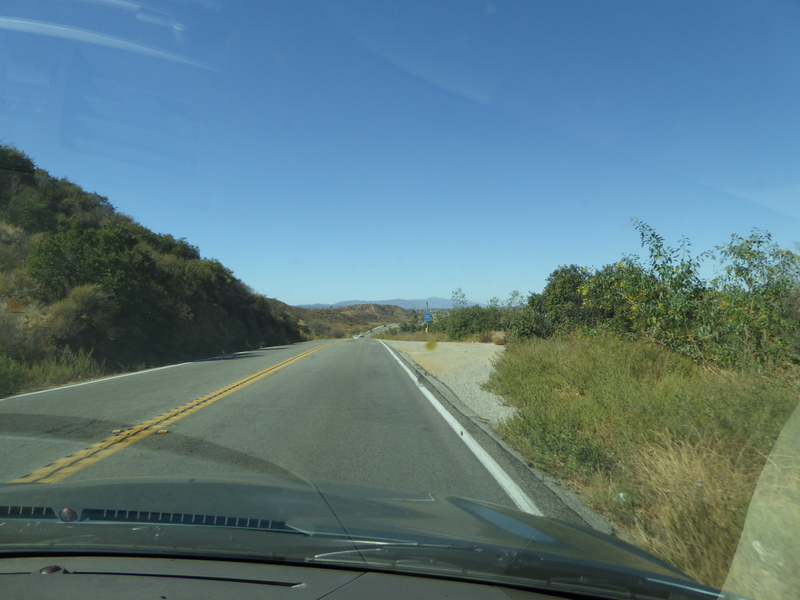 Highway 138 takes you to the turn off to Wrightwood, Highway 2, otherwise known as Angeles Crest Highway. You climb higher and higher in elevation, but without the normal twisting mountain roads. So lovely for the easily upset stomach. A few miles down the road you leave behind the desert and enter the mountains. There are typical mountain cabins, pine trees and cooler air. 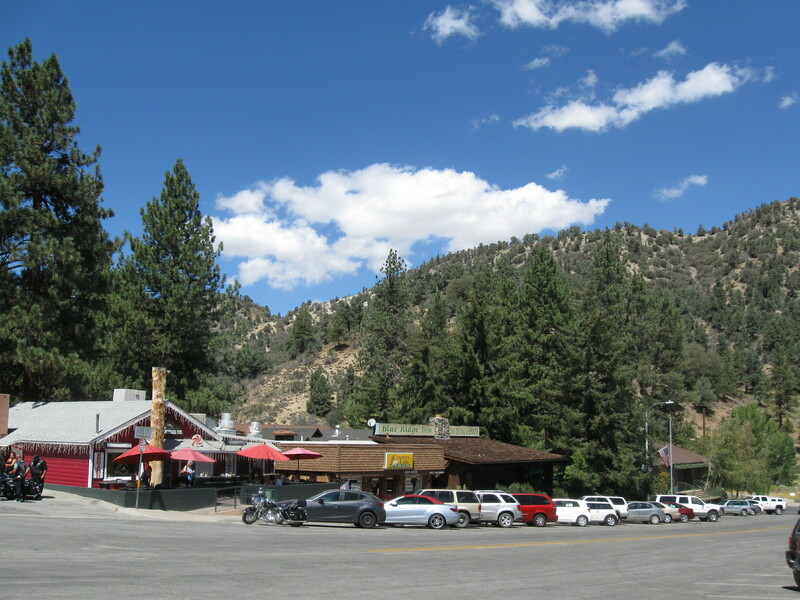 A little farther and you enter the town of Wrightwood. It is a small place but has lots of Mom and Pop eateries, not a chain restaurant in site. We decided to eat at the Grizzly Café. We all enjoyed our sandwiches which included a hamburger, a Reuben, a grilled cheese with tomato and avocado, and a BBQ beef sandwich. The home-made potato salad was good and the homemade potato ships were excellent. After lunch we drove down the street a little ways and found Park Drive. It had more cafes. and lots of little shops, including a used book store. The girls saw that and immediately demanded their Dad park the car. There are other stores, including antique stores, scattered throughout Wrightwood, but our time was limited (Eldest Daughter had to be to work by 3) so we decided to concentrate on Park Drive. We looked at the shops, bought a few books, and then headed home, happy that we finally got to visit Wrightwood. 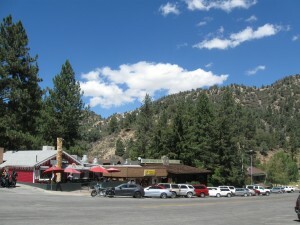 The sky was blue, the clouds were white, and the day was beautiful when we visited Wrightwood. 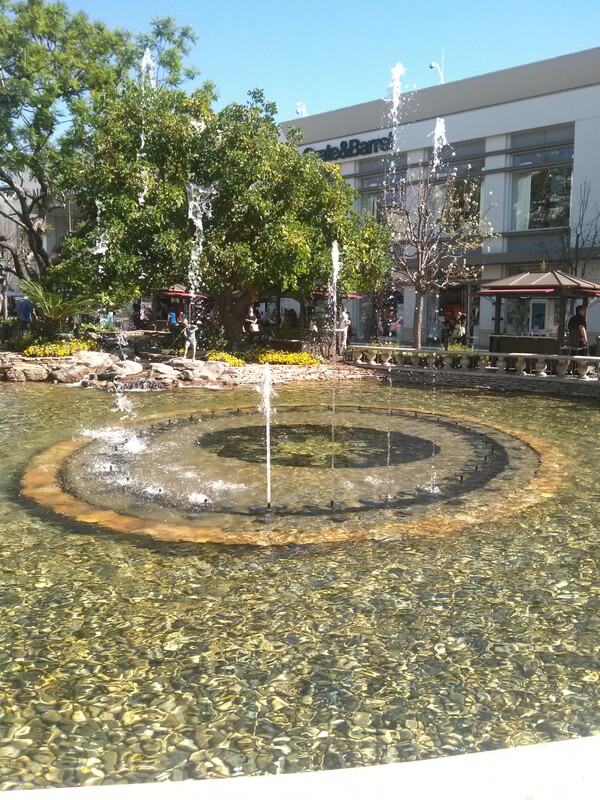 The Grove is an open air mall in Los Angles. 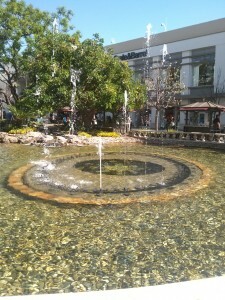 It is home to some higher end shops such as J.Crew and Michael Kors as well as unique stores such as the American Girl Place, the only one in California. There are a number of places to eat and that all important store to my family – a bookstore. The Grove has a HUGE parking garage that was a little weird and disconcerting to use, I will fully admit. Even my Hubby who commutes on California freeway every day to work (not for the faint of heart, I can tell you), found this parking garage a little C-R-A-Z-Y. As you are going up you have to merge out of the lane you are in, while going up a curve, diving between traffic cones, and looking over your shoulder to make sure no one is in the next lane over, coming up in your blind spot. That is why we parked on the sixth floor. It took that many floors for four adults to figure out what was going on and get the heck out of the lane that just took us up and into the lane that got us to parking. Whew! In the middle of the Grove was a fountain that danced to music, like a miniature Bellagio fountain. I was a little puzzled was why it was dancing to “Last Dance,” which is over 30 years old. But I still love dancing fountains, even if they are dancing to music that came out when I was in high school. We indulged while we were there with lunch at the Cheesecake Factory. Inside we admired the décor which, as Youngest Daughter pointed out, looked like most of it came from Lord of the Rings. The Cheesecake factory by us isn’t quite so fancy! Below is the dancing fountain. For dessert we skipped the cheesecake and stopped by Sprinkles Cupcakes instead. They were delicious! We tried triple cinnamon, chai tea, Cuban coffee, and milk chocolate. Yum! 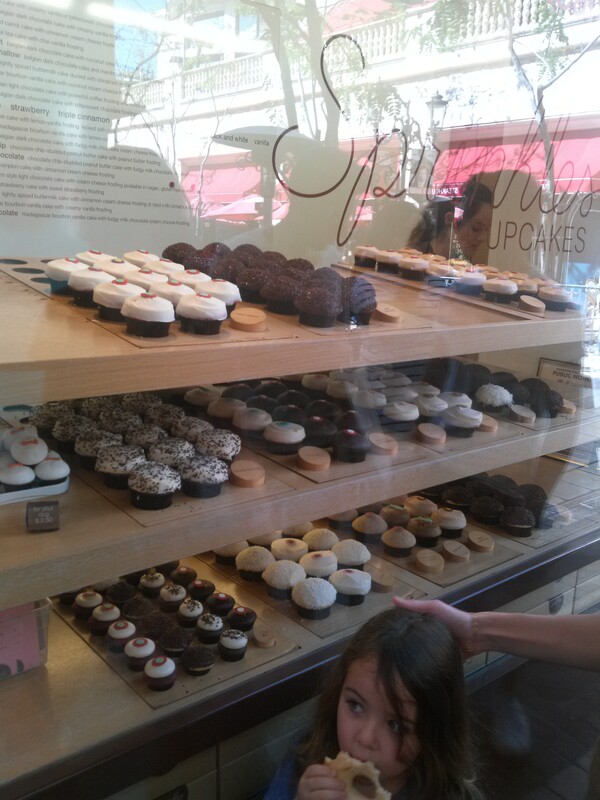 Below is a photo of the cupcakes we got to choose from. 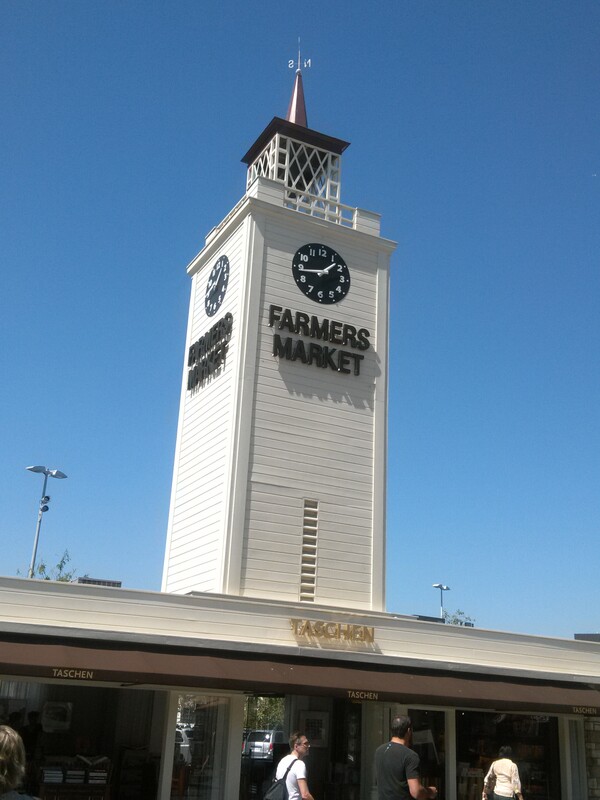 Right next door to the Grove is the Original Farmer’s Market. It is as different from the Grove as chalk is from cheese. It is full of places to eat and had we realized that we probably would have skipped the restaurant. You can get most anything there from Jewish deli to middle eastern, Asian cuisine to classic Mexican food. It is also a place where you can buy baked goods, fresh meat, fruit, vegetables, and cheese. 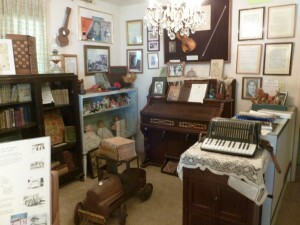 It also has souvenir shops, galore. So you can pick up a roast, some fresh cheese, and a California magnet all at the same place! It is definitely a fun place to look around, although it is mostly outdoors as well so can get warm if the temperature is a little high as it was when we were there. I noted on the map that there was a park across the street from the Grove. We didn’t have a chance to check it out but I was thinking we could have made a whole day of it between the Grove, farmer’s Market, and taking a walk around the park. Except for parking, which isn’t free, this could be a relatively inexpensive day out. You could eat at the Farmer’s Market, window shop to your heart’s content, sit and admire the fountain, and then check out the park. I needed to do some research recently for a new local history book I am writing. I am looking into a murder which happened in 1901 and the granddaughter of some of the principal people involved in the shooting is still alive and is the force behind a small museum located in the rural community of Anza, in southwestern Riverside County. I don’t know about you, but I enjoy the opportunity to get off the beaten path sometimes, and visiting the Hamilton Museum affords just such an opportunity. Anza is about a half an hour from the city of Temecula. The roads leading there take you through some interesting country with rocks and hills and the kind of rural scenery that is becoming more and more scarce in Southern California. The community of Anza has always been out-of-the-way, which is why it retains its rural flavor. It wasn’t until the late 1950s that an electrical co-op was formed in the Anza Valley, finally bring electricity and things like washing machines and dryers to the area. The Hamilton Museum is devoted to preserving the history of Aguanga, Anza, Garner Valley, Lake Riverside, Pinyon and Terwilliger areas of Riverside County. It is located on the Contreras property, and includes the John and Fanny Contreras house, built in 1924/25, which is decorated like a 1930 home. In 1945 Lincoln Hamilton, Fanny’s nephew, bought the land and the house. He and his wife Louise later built a new home on the property in 1964. 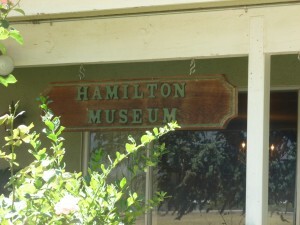 The museum itself is located in newer Hamilton house. 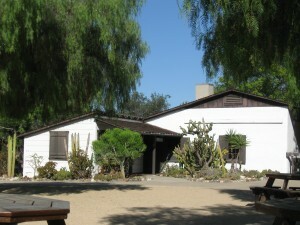 The property also includes a barn, left from the days when it was a working ranch, and a Native American garden which has plants used by the Cahuilla people. Don’t be surprised when you pull up and find yourself in front of what looks like a house. It is the museum. Just go on in the front door where you can sign the visitor log and begin exploring the many items on display. A view of the main area of the museum. There are loads of photos and lots of information on area families and days gone by. Margaret Wellman Jaenke is likely to be there when you visit. She is a walking encyclopedia of information on the area, the force behind the museum, and a descendent of many of the families you will learn about at the Hamilton Museum. 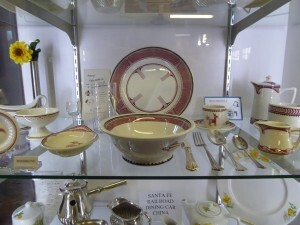 Margaret has also written a number of books about the area which are for sale at the museum or on the museum website. 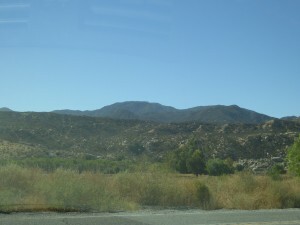 Anza is home to a Dairy Queen (56265 California 371), some mom and pop eateries, and to the Cahuilla Creek Casino (52702 California 371). The casino has the Roadrunner’s Bar and Grill in case you get the urge to gamble, eat, or both while you are in Anza. I didn’t stop at any of these places so I can not personally recommended them, but I did want you to know they are available. The Hamilton Museum is located at 39991 Contreras Rd (P.O. 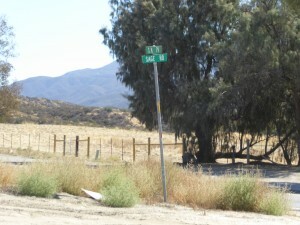 Box 391141) Anza, CA 92539. 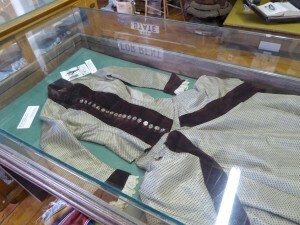 The museum is open Wednesdays and Saturdays 10-3.